Guess I should start a journal. Seems a goodly system of keeping this stuff organised ... . Anyway, I have fitted the OEM roof bars and Rola basket to Roo2 in the last couple of days. Took it for a spin into town today on the Nepean Highway. From about 70 km/h, it started to purr. By about 80 km/h, the purr had become a more of a roar ... . Some people put a small wind deflector on the leading edge of the basket...might help. Congratulations on the opening of your journal. I didn't expect the basket to stay on long, will be great on your trailer and save you a small fortune in fuel. Have a good Easter mate. Cool, so whens the lift coming along RB? A wind deflector is a good idea if the basket is loaded up, I think I will look into this for my next big trip when ever that is. 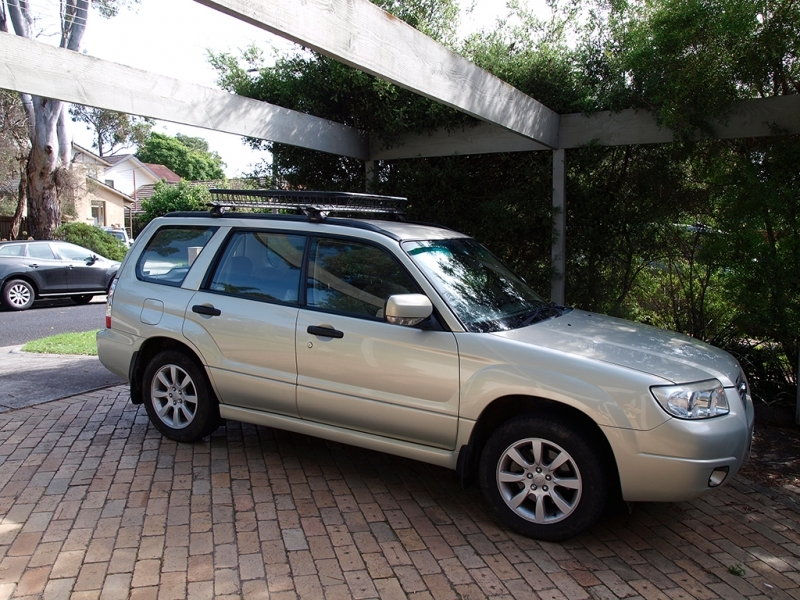 Although at my current rate it looks like its the Aus Subaru meet up in Coffin Bay Jan 2013. If your still looking at tyres and want all terrains with good tread you can get Yokohama Geolander AT-S in a light truck that have 16mm of thread!! Guaranteed to last atleast 80,000km. There are other options but the Geolanders seem to be the best compromise for an AT tyre for on and offroad use. A wind fairing for any roof basket is a must. I took mine off once and it didn't take long for it to drive me up the wall! Makes all the difference in the world. With it on, i don't get any noise at all unless the winds are very high. Nice, glad to see you started a Journal I can't wait to see more for the Fozzy. New tyres - Michelin XM2 215/60 16"
4X new Michelin XM2 215/60 x 16". The latter was OK for caster/camber at front, and camber at rear. Pretty much dead centre of the specs. No wonder that Roo2 was less than directionally stable! Thanks for all your positive replies and suggestions. The last week has been a tad "messy", shall I say? Thanks, ST. I spent most of Easter at a client's; then all day Tuesday until 2100H fixing a DNS cache/IP address conflict - while 5 people looked over my shoulder, with nothing else to do. I fixed that and all the problems went away. The diagnostic process is a trade secret - LOL . No lift, Taz. Roo2 is going to remain almost bog(ged) standard . And "too late", she cried, the Michelins went on this morning . Mr T, the latest tank has returned 11.99L/100kms - all short trips and suburban/urban driving. Using 4th for <60 km/h. Basket on for about 120 kms of it (1/4). Will post details in my "Oils ain't oils" thread in a few days' time. Thanks Matt. I can easily make one up out of half-hard aluminium if needs be. I like to listen to a Chopin Nocturne, without the Basso Continuo accompaniment also ... . I hope to get some photo processing and uploading done in the next couple of weeks. Currently I have dead computers running out of my ears! One of them is moving to Qld before the end of the month, so have to get my skates on with that one! good locking car ratbag! im assuming the new tires are road tires?